Meknes, located just 37 miles (60km) from Fez, is the least-visited of Morocco's Imperial Cities, and this is exactly what draws discerning travellers to discover its considerable charms. A city brimming with history but mercifully short on chaos, Meknes is the ideal destination for those looking to explore Morocco's rich, imperial past at a reasonable and measured pace. The city of Meknes was the brainchild of Moulay Ismail (ruler of Morocco for an incredible 55 years, between 1672 and 1727), who sought to construct a city fine enough to rival any in Europe. Although not the most sympathetic of rulers - most of the construction was done by Christian slaves who were kidnapped by Moroccan pirates from as far afield as Iceland - Ismail's vision was impressively followed through, and modern-day visitors to Meknes can revel in the wonders of more than 50 palaces, 20 beautifully-carved gates, and a city wall that stretches for 28 miles (45km). 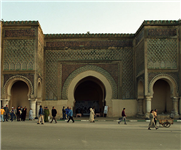 The city of Meknes has a wonderfully preserved medina area and a collection of great souks which can be navigated independently, without the need for a tour guide. Must-see sights include Bab Mansour, the grand gate of the imperial city, featuring splendid mosaics; and Dar El Makhzen, the historical palace of Moulay Ismail. Tourists to Morocco who want to experience its culture, but are wary of the frenetic nature of its cities, are strongly advised to make Meknes a feature of their travel itineraries.